Two Arizona state agencies are ordering a long-term care company to pay for a third-party manager to oversee the center where a patient in a vegetative state gave birth last month. In a letter Wednesday from top state health officials to Hacienda HealthCare's chief executive, the company is told to hire an outside manager at its own cost to "monitor and oversee the operations and appropriate delivery of health care services." The letter says there have been "several significant concerns raised" about Hacienda HealthCare's center. It was signed by Arizona Department of Economic Security Director Michael Trailor and Arizona Health Care Cost Containment System Director Jami Snyder. The state agencies said the third-party manager must be hired by Jan. 23 and in place by Jan. 30. The hire will have to be approved by the state, the letter states. The center's CEO has until 5 p.m. Thursday to respond to the state's demand, "or the state will pursue any and all of remedies legally available to it," according to the letter. Hacienda HealthCare said in a statement Wednesday that it "remains fully committed to ensuring the safety of its patients" and that its board of directors has taken the letter under advisement. "The Board is considering the best possible option forward — for Hacienda's patients and their families, for the Hacienda team and for the organization," the statement said. "We will respond to the state in short order, per the guidelines outlined by regulators." Last week, Phoenix police executed a search warrant seeking DNA samples from male staff membersat the Hacienda HealthCare center where the woman who has been in a vegetative state for years gave birth to a baby boy. The woman is nonverbal and incapable of moving on her own after suffering a near-drowning incident. She had been at the facility since she was 3 years old. The Arizona Department of Health Services and the state's Department of Economic Security have said they are working with police in their investigation. 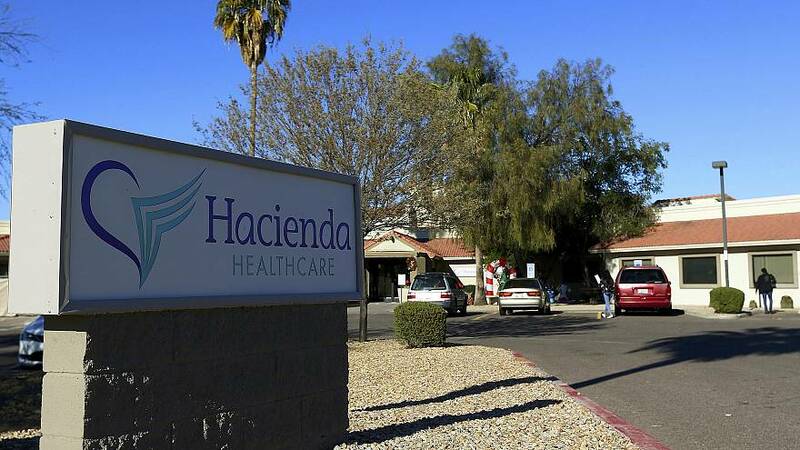 On Sunday, Hacienda HealthCare announced that it had hired a private attorney, former Maricopa County Attorney Rick Romley, to additionally conduct an "exhaustive" internal review. An attorney for the woman's family said Wednesday that her parents were aware of the hiring of Romley and the investigation. "My clients trust that Mr. Romley's investigation will be as promised — fully transparent — and made available to them as the victims of this appalling tragedy," the attorney, John Micheaels, said. "My clients also hope Mr. Romley's investigation will result in the changes at Hacienda necessary to prevent further abuse and neglect of its patients."